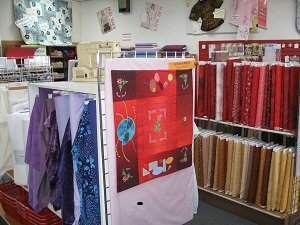 BERNINA / Stretch and Sew Fabrics offers everything you need for your sewing & quilting projects. We have been in business for 47 years, with the same owner & manager. We are proud to be a BERNINA dealer ( 39 years) and to provide the best continuous education for every machine we sell. We carry all the BERNINA accessories you want and can teach you how to use them. We have Embroidery Take Out,on our web site, the easy, quick & inexpensive way to get new embroidery designs for any brand of embroidery machine. Our expert staff is always ready to help you with your projects. Check our extensive catalog of classes and we are willing to customize one to fit your needs. We have 2 factory trained BERNINA technicians that do the service in house and we service all brands. In 2009 we attended BERNINA's 75th Anniversary Celebration in Switzerland with 4 of our staff. Event included a wonderful factory tour and introduction to the BERNINA 830E Computerized Sewing System. BERNINA of America treated us like queens with all the fun activities, wonderful dinners and side trips. The best being to the top Jungfrau Hoch one of the highest peaks in the Swiss Alps.